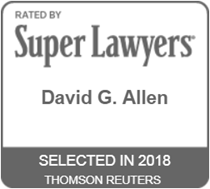 David Allen has developed his litigation expertise by trying cases in Texas courtrooms for more than twenty years, and he’s been with Stacy | Conder | Allen LLP since the firm was formed in 2000. He takes pride in the culture of the firm, which he describes as a place where clients get a lot of attention from all attorneys involved. The attorneys of the firm put the needs of the client before their own egos, and that means the client gets great service every time. It doesn’t hurt that David has had good examples of great lawyers all his life. David is Board Certified in Personal Injury Trial Law by the Texas Board of Legal Specialization and he’s also been certified in Civil Trial Law by the National Board of Trial Advocacy. His specialty is defending clients from injury and damage claims involving negligence, trucking, and transportation accidents, insurance bad faith, construction defect and a host of other issues. The insurance carriers who know David trust him to represent their interests and handle cases for their insureds with efficiency and attention to detail, and a vigilant eye on the bottom line. He is admitted to practice in the U.S. District Courts for the Northern, Southern, Eastern and Western Districts of Texas. He has been named to the Texas Super Lawyers list in 2007 and then 2009 through 2018, and he has earned the AV Preeminent (5.0 out of 5.0) Martindale Hubbell rating from his peers in the legal profession. David was the Notes and Comments Editor of the Baylor Law Review while earning his law degree from Baylor Law School. He is also a graduate of Texas A&M University, where he received his B.B.A. degree.